LONDON (AP) — Chelsea could squeeze into the Champions League after all. In the space of 20 days, Antonio Conte's side has reduced Tottenham's hold on fourth place in the English Premier League from 10 to two points. 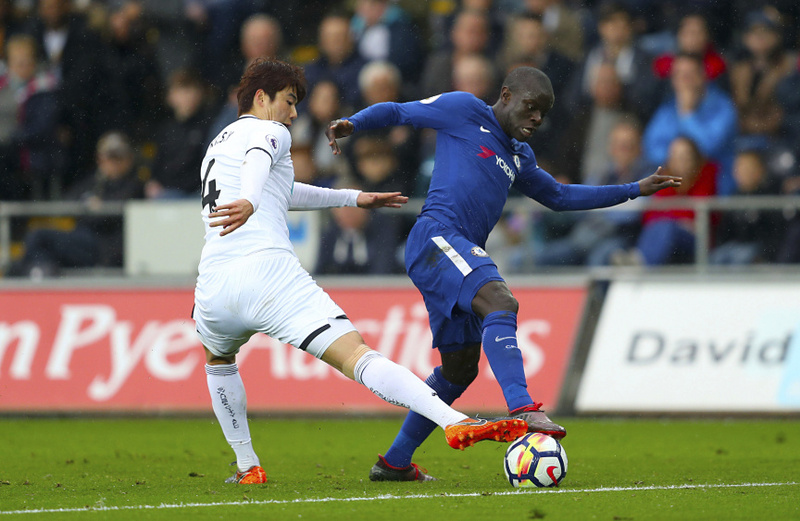 Cesc Fabregas was set up by Eden Hazard to secure a 1-0 victory over Swansea that gave Chelsea a third successive victory to take advantage of Tottenham's stumbles on Saturday. After Tottenham plays Watford on Monday, the north London club and Chelsea will have three games remaining. Adding further intrigue to the hunt for the three places below newly crowned champion Manchester City was Liverpool slipping to a third draw in four matches. With Mohamed Salah failing to score a 44th goal of the season, Liverpool was held by Stoke to 0-0. Juergen Klopp's priority is protecting a 5-2 advantage over Roma in the Champions League semifinals when it travels to Italy for the second leg on Wednesday. But if the five-time European champions aren't careful they might need to lift the cup again to secure a route back into the Champions League next season. Liverpool is only six points ahead of Chelsea having played a game more than the deposed champion it meets next Sunday at Stamford Bridge. Manchester United, which is two points ahead of Liverpool in second place, has four games remaining, starting on Sunday at home to sixth-place Arsenal. The three teams in the bottom three staved off relegation, for now. West Bromwich Albion has mounted an improbable recovery under caretaker manager Darren Moore. Matt Phillips sealed a 1-0 victory at Newcastle — Moore's second success in a four-game unbeaten stint — to nudge the last-place team five points from safety. That's where Swansea is, a place and a point above the drop zone. Stoke is sandwiched between Southampton and West Brom, separated by two points from both fellow strugglers. Dusan Tadic scored twice to give Southampton its first home win since November, 2-1 over Bournemouth. Huddersfield isn't out of danger yet, sitting three points above Southampton after being beaten 2-0 by Everton, whose goals came from Cenk Tosun and Idrissa Gueye. Cyrstal Palace looked doomed after losing its opening seven games without scoring. The south London club climbed to 11th place — six points clear of the bottom three — after beating Leicester 5-0. Wilfried Zaha again excelled and scored the opening goal and James McArthur doubled the lead before gaining a man advantage in the 55th minute. Marc Albrighton was sent off for bringing down Zaha. The goal flurry came in the last 10 minutes when Ruben Loftus-Cheek and Patrick van Aanholt netted and Christian Benteke struck a penalty. Leicester, the surprise 2016 champion, is six points ahead of Palace in ninth place. Burnley can start to dream of playing in Europe after a 51-year absence, with seventh place virtual assured after drawing with Brighton 0-0. The northwest England club is six points clear of eighth-place Everton with two games remaining and a superior goal difference. Brighton moved five points clear of the relegation zone with nine points to play for. Cardiff has the edge to join Wolverhampton in returning to the Premier League. Cardiff beat Hull 2-0 to reclaim second place in the second-tier League Championship, a point ahead of Fulham heading into the final round.